William Edward "Bill" Dudek was born on June 18, 1943, in Belle Plaine, Iowa. As both an athlete and coach, Bill Dudek is one of the most accomplished individuals in Yellowjacket history. As a Graceland student, Bill earned a school record 13 varsity letters before completing his bachelor's degree in 1961. He later earned his master's degree in physical education from Northest Missouri State University (Truman University) in 1972. He returned to Graceland in 1967 as a member of the physical education faculty and head football coach. During his 19 seasons helming the football team, Dudek emerged as the winningest coach in Graceland gridiron history, amassing 100 victories, 72 losses, and three ties. He coached the football team to 14 winning seasons and one .500 season. Coach Dudek, whose Yellowjackets posted 8-2 records during four of those seasons, also became Graceland's first football coach to advance a team to post-season bowl game after Graceland became a four-year school. "Duke" was named NAIA District Football Coach of the Year for seven seasons and was twice nominated for national coach of the year. He also laid claim to the most coaching wins in Graceland baseball history, collecting a 121-62 record over nine seasons. Coach Dudek also became the first person to achive 200 coaching victories in softball, which was accomplished during eight seasons. Off the field, Coach Dudek developed Graceland's adaptive P.E. program, worked in admissions for four years ant Talent Search for three years, and was part of the college's Upward Bound team for 20 years. Off campus, Coach Dudek has also worked as a security specialist for nine Super Bowls, eight Rose Bowls, and numerous concerts by top-name entertainers, and once escorted Presidents Ford and Nixon at the Republican National Convention. 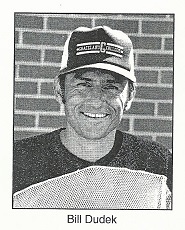 NOTE: Coach Dudek was inducted into Graceland's Hall of Fame in 1987. Edwards, Paul M. "The Hilltop Where. . . . An Informal History of Graceland College." Pp. 115, 121. Venture Foundation. Lamoni IA. 1972. Goehner, David. “The Graceland College Book of Knowledge: From A To Z.” Pp. 402-03. Herald House. Independence MO. 1997.